This Carlisle wood grain-look metric tray is a stackable, rectangular tray for food service applications. It is made of Glasteel fiberglass reinforced by metal rods for lightweight strength and resistance to warping. This tray is dishwasher safe and certified by NSF International for use in food handling and processing, and measures 0.63 x 20.87 x 15.16 inches/16 x 530 x 385 mm (H x W x D). (H is height, the vertical distance from lowest to highest point; W is width, the horizontal distance from left to right; D is depth, the horizontal distance from front to back. )Carlisle manufactures food service equipment and supplies and sanitary maintenance tools and supplies for commercial, industrial, and institutional facilities. The company, founded in 1954, is headquartered in Oklahoma City, OK. This Carlisle wood grain-look metric tray is a stackable, rectangular tray for food service applications. It is made of Glasteel fiberglass reinforced by metal rods for lightweight strength and resistance to warping. This tray is dishwasher safe and certified by NSF International for use in food handling and processing, and measures 0.63 x 20.87 x 14.76 inches/16 x 530 x 375 mm (H x W x D). (H is height, the vertical distance from lowest to highest point; W is width, the horizontal distance from left to right; D is depth, the horizontal distance from front to back. )Carlisle manufactures food service equipment and supplies and sanitary maintenance tools and supplies for commercial, industrial, and institutional facilities. The company, founded in 1954, is headquartered in Oklahoma City, OK. 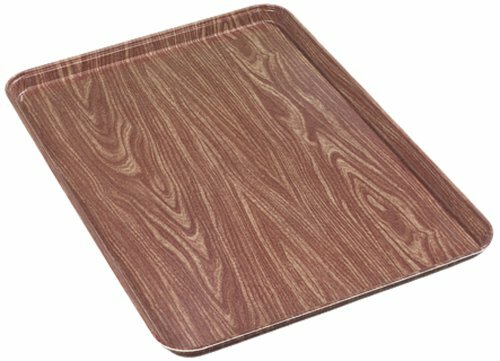 This Carlisle wood grain-look low-edge tray is a stackable, rectangular tray for food service applications. It is made of Glasteel fiberglass reinforced by metal rods for lightweight strength and resistance to warping. This tray is dishwasher safe and certified by NSF International for use in food handling and processing, and measures 0.62 x 20.25 x 15.00 inches (H x W x D). (H is height, the vertical distance from lowest to highest point; W is width, the horizontal distance from left to right; D is depth, the horizontal distance from front to back. )Carlisle manufactures food service equipment and supplies and sanitary maintenance tools and supplies for commercial, industrial, and institutional facilities. The company, founded in 1954, is headquartered in Oklahoma City, OK. This Carlisle wood grain-look Euronorm tray is a stackable, rectangular tray for food service applications. It is made of Glasteel fiberglass reinforced by metal rods for lightweight strength and resistance to warping. This tray is dishwasher-safe and meets NSF International standards for use in food handling and processing. It meets Euronorm dimension standard EN 631-1 for food service products, and measures 0.67 x 17.72 x 12.60 inches/17 x 450 x 320 mm (H x W x D). (H is height, the vertical distance from lowest to highest point; W is width, the horizontal distance from left to right; D is depth, the horizontal distance from front to back. )Carlisle manufactures food service equipment and supplies and sanitary maintenance tools and supplies for commercial, industrial, and institutional facilities. The company, founded in 1954, is headquartered in Oklahoma City, OK. This Carlisle wood grain-look display/bakery tray is a stackable, rectangular tray for displaying food in bakery and deli display cases. It is made of fiberglass reinforced by metal rods for lightweight strength and resistance to warping. This tray meets NSF International standards for use in food handling and processing. It measures 1.00 x 17.75 x 12.75 inches (H x W x D). (H is height, the vertical distance from lowest to highest point; W is width, the horizontal distance from left to right; D is depth, the horizontal distance from front to back. )Carlisle manufactures food service equipment and supplies and sanitary maintenance tools and supplies for commercial, industrial, and institutional facilities. The company, founded in 1954, is headquartered in Oklahoma City, OK. This Carlisle wood grain-look metric tray is a stackable, rectangular tray for food service applications. It is made of Glasteel fiberglass reinforced by metal rods for lightweight strength and resistance to warping. This tray is dishwasher safe and certified by NSF International for use in food handling and processing, and measures 0.63 x 12.80 x 10.43 inches/16 x 325 x 265 mm (H x W x D). (H is height, the vertical distance from lowest to highest point; W is width, the horizontal distance from left to right; D is depth, the horizontal distance from front to back. )Carlisle manufactures food service equipment and supplies and sanitary maintenance tools and supplies for commercial, industrial, and institutional facilities. The company, founded in 1954, is headquartered in Oklahoma City, OK. 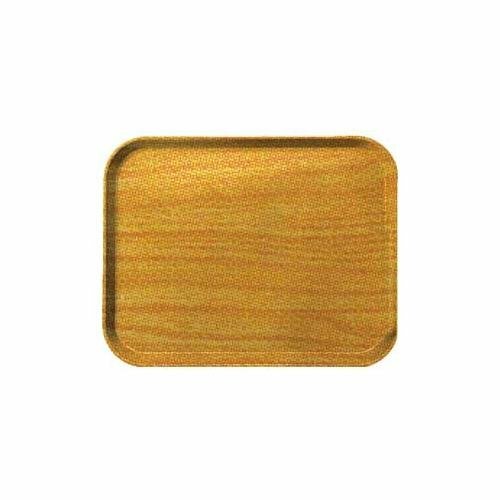 This Carlisle wood grain-look tray is a stackable, rectangular tray for food service applications. It is made of Glasteel fiberglass reinforced by metal rods for lightweight strength and resistance to warping. This tray is dishwasher safe and certified by NSF International for use in food handling and processing, and measures 1.05 x 22.12 x 16.00 inches (H x W x D). (H is height, the vertical distance from lowest to highest point; W is width, the horizontal distance from left to right; D is depth, the horizontal distance from front to back. )Carlisle manufactures food service equipment and supplies and sanitary maintenance tools and supplies for commercial, industrial, and institutional facilities. The company, founded in 1954, is headquartered in Oklahoma City, OK. This Carlisle wood grain-look metric tray is a stackable, rectangular tray for food service applications. It is made of Glasteel fiberglass reinforced by metal rods for lightweight strength and resistance to warping. This tray is dishwasher-safe and meets NSF International standards for use in food handling and processing. It measures 0.63 x 20.87 x 12.80 inches/16 x 530 x 325 mm (H x W x D). (H is height, the vertical distance from lowest to highest point; W is width, the horizontal distance from left to right; D is depth, the horizontal distance from front to back. )Carlisle manufactures food service equipment and supplies and sanitary maintenance tools and supplies for commercial, industrial, and institutional facilities. The company, founded in 1954, is headquartered in Oklahoma City, OK. 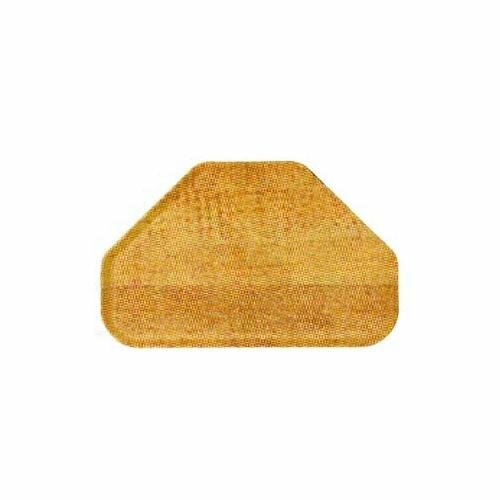 This Carlisle wood grain-look tray is a stackable, trapezoid-shaped tray for food service applications. It is made of Glasteel fiberglass reinforced by metal rods for lightweight strength and resistance to warping. This tray is dishwasher safe and certified by NSF International for use in food handling and processing, and measures 0.88 x 22.00 x 14.06 inches (H x W x D). (H is height, the vertical distance from lowest to highest point; W is width, the horizontal distance from left to right; D is depth, the horizontal distance from front to back. )Carlisle manufactures food service equipment and supplies and sanitary maintenance tools and supplies for commercial, industrial, and institutional facilities. The company, founded in 1954, is headquartered in Oklahoma City, OK. Looking for more Woodgrain Fiberglass Tray similar ideas? Try to explore these searches: Rosa Cup, 16' Stainless Steel Rectangle Sink, and Book Wallet. Look at latest related video about Woodgrain Fiberglass Tray. Shopwizion.com is the smartest way for online shopping: compare prices of leading online shops for best deals around the web. Don't miss TOP Woodgrain Fiberglass Tray deals, updated daily.